The International Association of Amusement Parks and Attractions (IAAPA) today announced registration is now open for IAAPA Attractions Expo 2018 at the Orange County Convention Center in Orlando, Florida, Nov. 12-16, 2018. More than 35,000 global amusement park and attractions industry professionals from more than 100 countries will gather to buy, learn, and network at the largest international conference and trade show for the global attractions industry. This year's Expo will celebrate the association's 100th anniversary with more than 1,000 exhibiting companies showcasing the latest innovations, countless networking opportunities connecting professionals from around the world, and hundreds of industry experts leading inspiring discussions. The global attractions industry market has an estimated $360 billion global economic impact. IAAPA Attractions Expo 2018 brings together international attractions industry professionals, decision makers, and visionaries from all segments including manufacturers and suppliers and owners and operators of theme and amusement parks, water parks, family entertainment centers, zoos, aquariums, science centers, museums, and resorts. 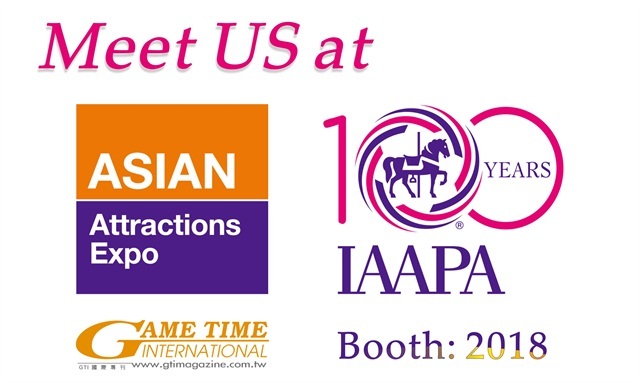 IAAPA Expo will be held in Orange County Convention Center from Nov. 12th to 16th and GTI will attend the expo.